OK. So I need to make an admission right out of the gate here: The climax of this story is a bit underwhelming. The story I'm about to tell you is interesting, and my sensationalist headline is 100% true: BCLC did try to keep something secret for six years and I'm about to make it public right here for the first time. But the actual "reveal" at the end of it all is, well, kind of a letdown. The upside is that the most interesting part of this story may still be to come. And that's where you come in. The story begins seven years ago on April 9, 2010. That's when I sent BCLC a Freedom of Information request asking for a breakdown of where the users of its PlayNow online gambling site lived. 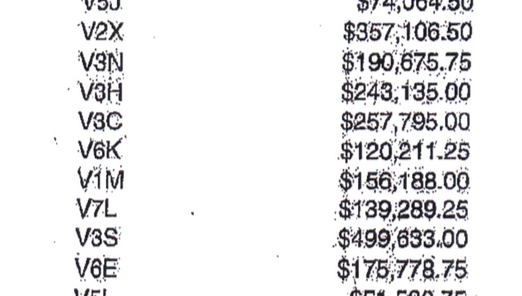 Specifically, I asked for the total value of all PlayNow sales in each "Forward Sortation Area", or FSA. An FSA is the first three digits of your postal code and it corresponds to different areas of the province. The motivation behind my request was several data journalism stories I'd seen from the U.S. that showed that poorer neighbourhoods were more likely to play the lottery than richer ones. (This story is from 2016 but similar stories have been done dozens of times over the years by U.S. newspapers.) 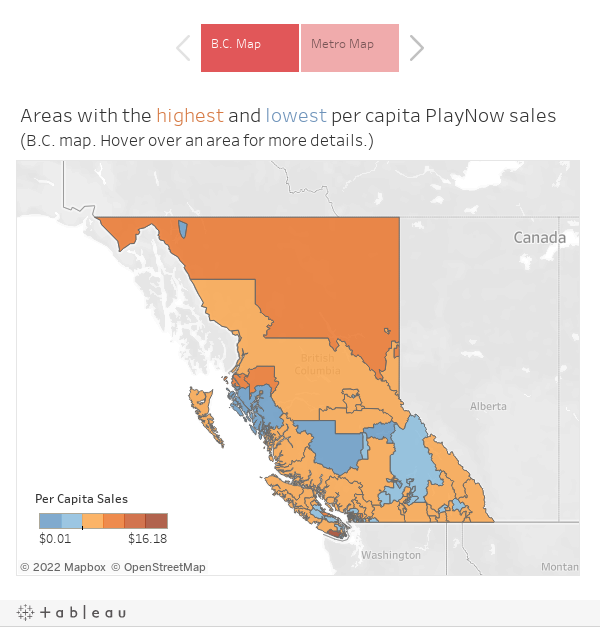 With PlayNow sales by neighbourhood, and income data from Statistics Canada, I figured I could see if there was a similar pattern in B.C. 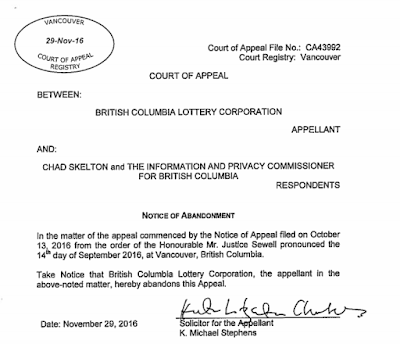 I'd actually tried doing this story once before, by filing a Freedom of Information request to BCLC for a breakdown of paper lottery ticket sales at retail outlets by FSA. BCLC actually coughed up that data without a fight. But I found no correlation between an FSA's median income and its lottery sales. The problem with that data, I realized, was that people buy their lottery tickets all over the place — on their way to work, while doing their groceries — and so the areas with the highest "per capita" lottery sales tended to be those with low populations but a big mall. PlayNow data would be different, I figured, as the postal code associated with each sale would be that of the gambler themselves. With that data in hand, I could actually figure out if poorer neighbourhoods were more likely to gamble — and the topic seemed timely, as BCLC was just starting to expand beyond selling lottery tickets online to offering more addictive online casino games, too. So off the request went. My next step was filing a complaint with the Office of the Information and Privacy Commissioner, the independent agency that oversees the FOI process in B.C. The OIPC does good work but it doesn't do it very fast. So it wasn't until a year later, in the spring of 2011, that the case went to a formal hearing where both sides submitted their written arguments for why the sales data should or should not be made public. And then, on August 25, 2011, the OIPC released its decision, finding in my favour and ordering BCLC to release the records. Now, one of the great things about B.C. 's Information Commissioner — unlike her federal counterpart — is that she has what's called order power. That means that the decisions of her office are legal orders that need to be complied with immediately (unlike the federal Commissioner's orders, which are more like recommendations). So that meant that, with this ruling, BCLC was legally required to provide me with the sales data. Every other time I won a case before the OIPC, that was the end of the story: The documents would arrive a few weeks later and that would be that. Except that agencies actually do have one other option available to them: Take the Information Commissioner to court. Which is what BCLC did, seeking a judicial review of the Commissioner's decision in front of the B.C. Supreme Court. Specifically, BCLC argued, among other things, that the Commissioner didn't properly treat one of its "expert witnesses" as an expert. A bunch of court proceedings followed over the next couple of years (The Vancouver Sun could have taken part but we decided to let the OIPC handle it). Then, on January 8, 2013 — almost three years after my original request — the B.C. Supreme Court ruled in BCLC's favour. BCLC had asked the B.C. Supreme Court to just overturn the OIPC's ruling and let it keep the information secret. But, instead, the judge sent the case back to the OIPC for another ruling. Which meant doing the whole hearing thing all over again. So fast forward another couple of years and we're at October 13, 2015 — five and a half years after my original request and after I've taken a buyout from The Sun — and the OIPC releases its second ruling in the matter, finding once again that I was entitled to the records. If you think really hard, you can probably see what comes next. Yep: BCLC took the Information Commissioner to court again. Once again, I didn't have much to do with the court case, except for getting occasional emails from BCLC's lawyers making sure I was properly served with all the documents in the case. The following fall, on Sept. 14, 2016, the B.C. Supreme Court made its decision — this time upholding the OIPC's second ruling. According to one of BCLC's lawyers who emailed me, the decision was made orally from the bench and I haven't been able to find a transcript published anywhere online. Was that the end of the story? Not quite. 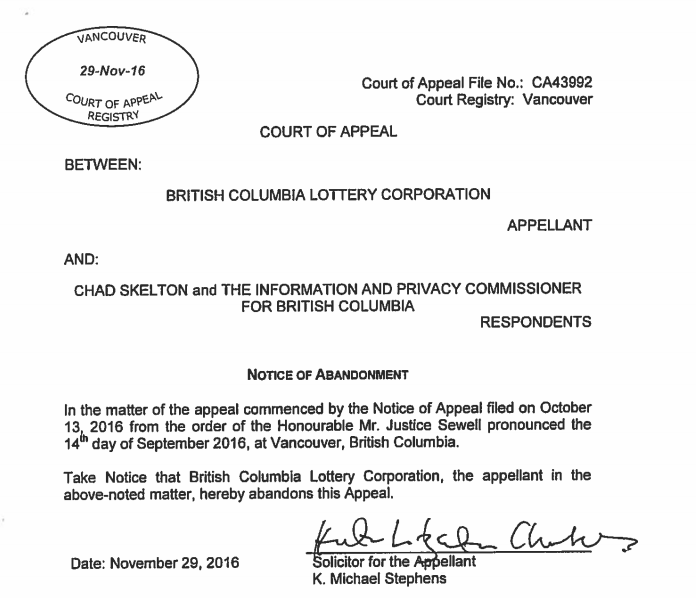 On October 13, 2016, BCLC sent me a notice that they intended to appeal the court's decision to the B.C. Court of Appeal. But then, mysteriously, a month later on November 29, they sent me another notice that they were abandoning their appeal. The next day, November 30, 2016, BCLC finally mailed me the requested records — 2,427 days after I had originally asked for them. But they still had one more trick up their sleeves. While my original request clearly asked for the records in spreadsheet format, so I could more easily analyze the figures, BCLC instead sent me four badly photocopied, barely legible pages. And this, dear reader, is where I need to confess that while the vast majority of the delay in making these records public is BCLC's fault, the last 130 days or so are on me. It's hard enough getting motivated to analyze six-year-old data. It's even harder when you know it's going to start with a good hour or two of manual data entry. I also had a lot of other stuff on my plate this winter, like developing my new course at the University of Florida. So the BCLC envelope stayed on my desk for a few months. Then, finally, I found some time a couple of weeks ago to type in the numbers by hand and start doing some basic analysis on the figures. And what I found, as I warned you at the start, was pretty underwhelming. I could find no evidence that poorer neighbourhoods are more likely to gamble online than richer ones. Indeed, what weak correlation exists actually runs in the opposite direction (the richer your neighbourhood, the more it gambles online). I tried comparing a few other demographic characteristics from the 2011 National Household Service but came up empty. Mapping the data, the best I can come up with is that it appears rural areas may be more likely to gamble online than urban areas, which kind of makes sense: Those in rural areas may not have easy access to a casino. If you'd like to look at the data yourself, you can find it here (to download an Excel file, just click on File/Download in the top left corner). The first sheet is the data provided by BCLC itself, manually entered by yours truly. The second includes the data I added in for analysis (population, per capita spending and median income). So is that the end of the story? There's a bit of a mystery here. If this data was so innocuous, why did BCLC fight so hard to keep it secret? It's possible I'm missing something in the data (which is why I'm making it public). But I suspect what BCLC was really worried about was not this data, per se, but the precedent it would set if it was forced to release it. And that's because, since this request was filed, PlayNow has become a much bigger business for BCLC. Based on a review of a couple of BCLC's annual reports, "eGaming" brought in $135 million in revenue last year, more than five times the $23.5 million in revenues for 2008/09, the year my request was for. Furthermore, looking closely at the PlayNow numbers I was provided with, there are some odd figures for some areas. For instance, while most postal code areas had totals in the tens or even hundreds of thousands of dollars, V2C, a postal code area in Kamloops with more than 20,000 residents, had a total spend on PlayNow for 2008-09 of just $157. On the other side, V0S, a remote area of Vancouver Island with just 125 residents had a total spend of $48,412. That gives V0S by far the highest per capita PlayNow spending in the province ($387, the second highest is V6C at $16). It's hard to know for sure, but I suspect that may just be one guy with a really bad gambling habit. 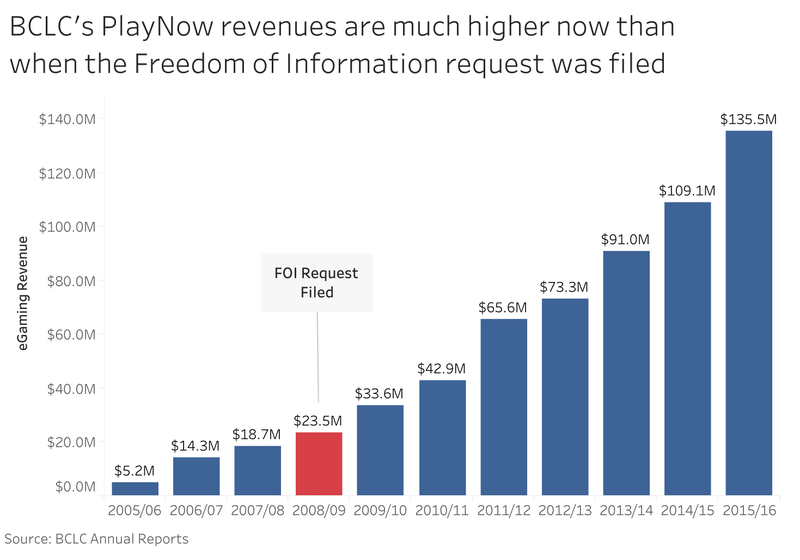 The point is, with just one year of data from a time when PlayNow was still in its infancy, the data is too noisy to make any meaningful conclusions about where B.C. 's online gamblers live and whether there's any correlation between gambling and other factors like income. To do that, we'd need to know what the regional patterns in PlayNow gambling have been since 2008/09. Which is where you (maybe) come in. As I'm sure you can imagine, I'm not eager to take another kick at the can here. Especially because I no longer work in a newsroom and so don't have an outlet to publish the results of whatever I find. But I do think there's a story here, and I'd like to make it as easy as possible for someone else to find it — whether that's another journalist out there or an advocacy group with an interest in gambling. As it happens, BCLC has an online form you can use to file a Freedom of Information request without having to draft a letter or buy a stamp (you can also fax or mail in your request). In electronic database format, the total value of products purchased through BCLC's PlayNow website in each fiscal year from 2009-10 to 2016-17 in each Forward Sortation Area (FSA) in British Columbia. Please provide me with a list of total sales by FSA for the entire period and a breakdown by year. I draw your attention to OIPC order F15-58, upheld by the B.C. Supreme Court in September 2016, which found BCLC was legally required to provide such records for an earlier time period. I am asking for these records in spreadsheet format (Excel or CSV) NOT on paper or as a PDF. I draw your attention to OIPC order F10-16 which found that government agencies are required to provide records in spreadsheet format when they are technically able to do so. Now, if history is any guide, I doubt BCLC will just release these records without a fight. But given the legal precedent that now exists, I don't think BCLC will have much of a legal leg to stand on and hopefully it should take fewer than six years to get the records. Also, if anyone takes this up, I'd suggest — while BCLC fights you on your original request —to keep filing a new request each year to BCLC for the following year's records. That way you've already got those requests in the pipeline. In retrospect, I wish I'd done that. I realize this post probably isn't the greatest advertisement for filing an FOI request with BCLC. And I appreciate the hypocrisy of asking someone else to do what I no longer have the patience for. But I firmly believe that if government agencies can get away with these kinds of ridiculous delays, transparency suffers. And, frankly, I feel like six years fulfills my duties on this file and it's time to pass it on to someone else. That said, if you do file a request and end up in an OIPC hearing with BCLC, drop me a line and I'd be happy to share my written submissions with you so you can copy from them. It will literally only take you a minute to go over to BCLC's online form right now and get the ball rolling on your own request. And the more of you who do it, the more BCLC will learn they can't get away with this kind of secrecy. Since this is for online gambling, I wonder if BCLC's location data comes from IP addresses and so is aggregated by internet provider; eg someone in Kamloops (V2C) has an IP address based on their ISP whose datacentre is on the Island (V0S)! Or do you know for sure that it's based on the postcode given in a user account? Because it looks like you didn't ask, and they didn't say! Interesting question Mark. You're right, I didn't specify in the request and they don't specifically say in the reply. But you need to provide credit card info when you sign up for PlayNow, and that would include your postal code. So I've assumed that's where this info comes from. I also don't recall anything in the hearing process that suggested it was based on IP address. The implication was always that it was from customer records. I don't know enough about IP addresses to know if the patterns here would make sense if it was based on IP but my gut says no. The rates are higher in rural areas than urban ones, and wouldn't it be more likely that a rural user would use an ISP that was based on an urban area than the other way around?